School may be out for summer, but learning never needs to take a break if you've got an iPad. The apps we look at in this latest installment of Digital Reading Room take those summertime trips to museums and zoos and recreate them in a tablet-sized package. Even if you're not naturally inclined toward ancient history, endangered animals, or modern design, you're likely to become engrossed in each of the compelling introductions to the subjects offered through this trio of apps. In 76 A.D. Mount Vesuvius erupted, burying Pompeii and Herculaneum in lava and ash. It was a horrific tragedy; killing thousands while most were able to flee (and abandon) the thriving cities. The sudden, quick and catastrophic event was almost forgotten for 1600 years until the two buried cities were rediscovered in the 1700s and excavation work began. What archaeologists found were cities almost frozen in time. The hardened lava kept much of both organic and inorganic matter so well preserved that even the most mundane details of everyday life from an ancient time were able to be discerned by scholars. The British Museum's exhibit on Pompeii, Herculaneum, and the Vesuvius eruption has been a great hit in London. This app is meant to be a guide for those planning to visit, though it can also provide a sample of what's on display for those who can't make it to the museum. (In addition to this iPad-optimized version, the British Museum also offers separate versions for the iPhone and Android devices.) The app is beautifully executed, including includes images of many items that were excavated along with explanations of how they were used. You'll also find short videos either dramatizing or explaining what life was like. Via the app, you can understand how citizens of the cities worked, ate, socialized, and shopped. The app explores the cities' public and private spaces while describing the era's political, social, and cultural issues. Pompeii and Herculaneum each had long, rich histories before being buried by Vesuvius, and this app provides an excellent introduction to the cultural riches left behind. WWF Together, an app produced by the World Wildlife Foundation, is an exemplar of how to successfully package rich, interactive, multimedia material that can appeal to both children and adults while effectively promoting a cause. Users can learn about a dozen endangered or threatened animals (giant pandas, snow leopards, whales, polar bears, and more) via photos, videos, text, and interactive elements. Each of the animals gets featured in a separate sections, boasting their own unique interactive elements. For example, you can get an idea of how loud the blue whale's call is by comparing it to the sound of rustling leaves and a jet engine, briefly experience the stillness required by polar bears hunting for seals, and compare your night vision to that of a tiger. WWF Together does mention the work it's doing to preserve the animals, and what more needs to be done. The app includes relatively subtle appeals for help that become harder to ignore as you immerse yourself in this digital world of animals. The iPad is not among the 59 items London's Design Museum highlights in its iPad app. Whether or not this is an oversight in an app that, in the museum's words, "explores key moments in design history" is debatable. And that's a cool thing about this well-designed app: It's likely to inspire debate--or at least thoughtful consideration--about what makes for great design. The Design Museum Collection app features only a small fraction of the museum's collection of more than 3000 items. It divides the included objects into five basic categories--architecture, furniture, graphics, products, and transportation. Like the museum itself, the app focuses on the past 100 years or so. 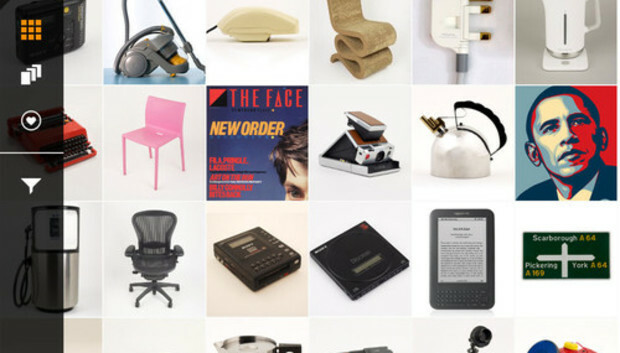 A tap on a thumbnail photo of an item launches a page that includes a large photo, some descriptive text, and a brief "talking head" video about the item by Design Museum director Deyan Sudjic. After tapping on the large photo at the top of the page, you can also view a mini slideshow showing the object from different angles. You can browse the items in any order, or sort them by category, type (camera, clock, chair, and so forth), designer, manufacturer, place of origin, color, and material (leather, plastic, steel, and the like). The ability to sort objects in multiple ways is fun and illuminating--a couple of taps reveals that the app's two items that include both leather and wood are the Bauhaus Wassily armchair ... and the Sony Discman. The app also enables you to create your own collection of favorites.